Mexico's patron saint, Virgin of Guadalupe, is honored on December 12 each year. 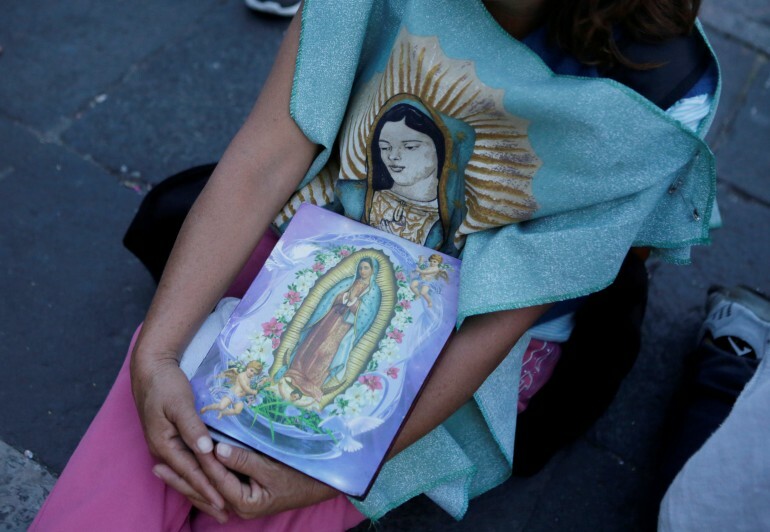 The celebration draws millions of people to Mexico City to visit the area where the Virgin of Guadalupe--who is also called Our Lady of Guadalupe or Nuestra Señora de Guadalupe--appeared to the Mexican people. The celebration includes traditional music and songs for the Virgin, bringing gifts for the Virgin, and many pilgrims walking on their knees on the stone streets that lead up to the Basilica to ask for a miracle, or to thank the Virgin of Guadalupe for fulfilling a request. Vendors set up shop to sell food, crafts and clothes and altars built with flowers are created in her honor. 1. The history behind celebrating the Virgin of Guadalupe goes back to when Spaniards intended to convert the indigenous indians to Catholics. They faced many battles, as the local Mexican people strongly believed in their regional gods. But things began to change once the story of Juan Diego and the Virgin of Guadalupe was known. 2. Juan Diego, a young indigenous man, was taking a stroll on Dec. 12, 1531 when the Virgin Mary suddenly appeared to him as a young woman with black hair and dark skin. The Virgin Mary told Juan Diego to to go to the then-Bishop and request that he build a church at the Hill of Tepeyac. 3. After Juan Diego told the Bishop, he ignored his request. The Virgin Mary then appeared to Juan Diego once again, and this time around, she asked him to pick flowers from the top of the hill. Since it was winter, Juan Diego believed there would be no flowers. However, upon reaching the hill, he found it filled with castillian roses. He listened to the Virgin Mary's order and collected flowers with his coat. When Juan Diego made it to the Bishop, the Virgin Mary's face was traced on his coat and the Bishop built the Basilica of the Virgin of Guadalupe on the hill of Tepeyac in Mexico City. 4. The Basilica of the Virgin of Guadalupe that was created in 1531 was called the "Templo Expiatorio a Cristo Rey." Through the 16th and 17th centuries, parts were added until total completion in 1709. 5. The current Basilica of the Virgin of Guadalupe began construction in 1974 and was completed in 1976 by architect Pedro Ramírez Vázquez. The new basilica was created because the older one began sinking due to its weak foundations. The new basilica houses the image of the Virgin, and boasts a circular plan so that her image can be seen from any direction. 6. Día de la Virgen de Guadalupe became a national holiday in Mexico in 1859.